WifiMETRIX is a new diagnostic tool used to analyze and test Wi-Fi networks. It is a new type of diagnostic tool that uses a dual-band 802.11 (i.e. Wi-Fi) chip to monitor and troubleshoot Wi-Fi networks. WifiMETRIX is a handheld device that operates in stand-alone mode -- that is, it does not associate or connect with an AP. It implements two important features AirHORN and WifiPROBE. The built-in Wi-Fi chip can perform both signal generation/packet injection (AirHORN) and throughput diagnostics (WifiPROBE) on each channel. The AirHORN function is an RF signal/channel generator that transmits stable and accurate RF signals for each of the Wi-Fi channels, and aids in testing Wi-Fi antennas, RF shields and wireless networks. The AirHORN feature aids in testing WiFi antennas, RF shields and wireless networks. It is an RF channel/signal generator that covers both the 2.4x and 5.x GHz ISM bands and was designed for microwave and RF applications. Using 802.11 packet injection, AirHORN transmits stable and accurate RF signals for each of the 802.11 (Wi-Fi) channels and is ideal for stress-testing existing wireless networks and for use in research and development of antenna design. A signal generation system is key to any test system – as such, AirHORN can also be used for rapid evaluation of receiver performance and detecting"dead spots". Click here to see Network World's review of the previous version of AirHORN that used a dual-band, 802.11 USB dongle. TheWifiPROBE function traverses each channel and measures the available transmit time. When the goal is to choose the best channel -- the one with the highest available throughput -- thenWifiPROBE is the tool of choice. The WifiPROBE feature provides unprecedented visibility into the performance of a wireless network. The information collected and displayed helps to simplify troubleshooting of interference-related problems and predicts the throughput performance of each 802.11 channel. WifiPROBE employs IMMI technology with 802.11 hardware to perform data acquisition — hence, the results truly reflect how packet congestion and RF interference in the local environment affects your Wi-Fi network. This is not possible using an RF spectrum analyzer or other tools currently on the market. The most common tools for troubleshooting Wi-Fi networks are Wi-Fi scanners (i.e. 802.11 network discovery software) and RF spectrum analyzers. Both have their limitations -- e.g. a Wi-Fi scanner only reports the strength of a beacon signal and an RF spectrum analyzer only measures raw RF energy. Neither are capable of providing any clues about network performance or available channel throughput. 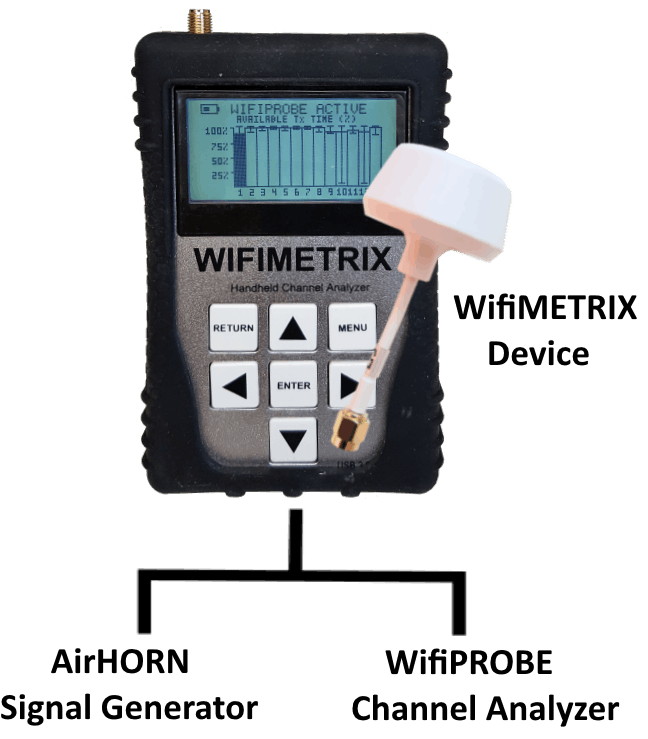 Only a Wi-Fi chip is capable of ranking the quality of each Wi-Fi channel, so WifiMETRIX is a better diagnostic tool than spectrum analyzers.